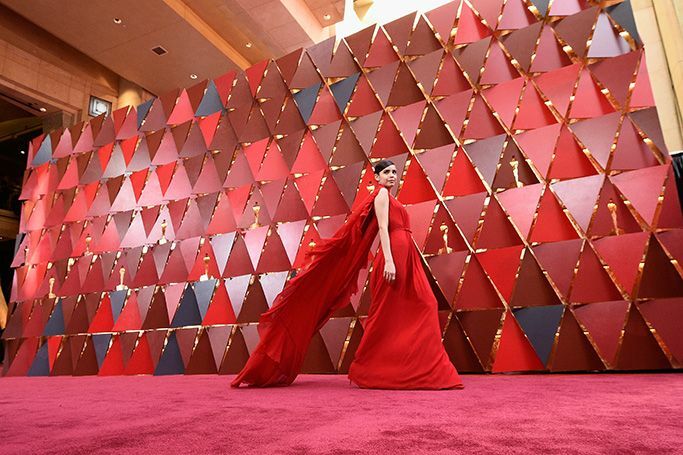 The 90th Academy Awards at the Dolby Theatre in Hollywood, LA took place last night as the red carpet fashion featured embellished goddess gowns, beautiful ethereal dresses and bold bursts of striking colours. We’ve listed just 10 of the best dressed celebrities we spotted on the Oscars 2018 red carpet, as this year’s celebrity guests and nominees brought show stopping gowns to our screens. From Jennifer Lawrence in embellished Christian Dior and Lupita Nyong’o in gold Versace, to Nicole Kidman and Jennifer Garner in vibrant cobalt and electric blues, the Oscars 2018 displayed a series of dramatic dresses we instantly loved. In comparison to recent red carpets which have been more about the politics than the fashion, the red carpet vibe was bright as celebrities ended the awards season with an optimistic show of glitz and glamour.